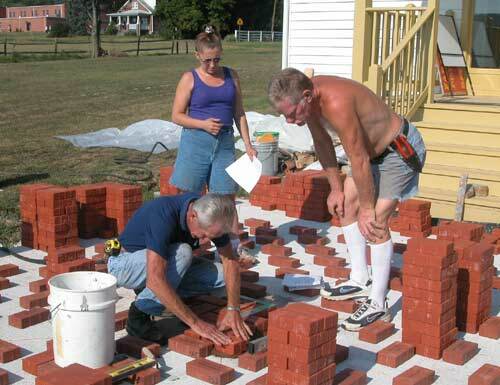 Our team of Carl Conrad (kneeling), Tracey Edwards and Bill Carl are hard at work figuring out the artistic layout of our patio of Memorial Bricks. The pattern is a bit difficult, but they have the plan figured out. The layout has the names of the men killed in the Battle of Great Cacapehon in the center of the patio. Since Capt. 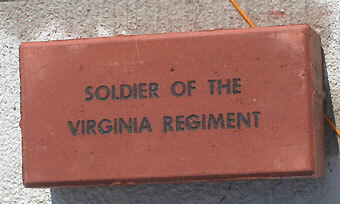 John Fenton Mercer and Ensign Thomas Carter are the only ones whose names we know, the soldiers have this brick (on the right) for their marker. In colonial times the names of the common soldiers were seldom remembered. 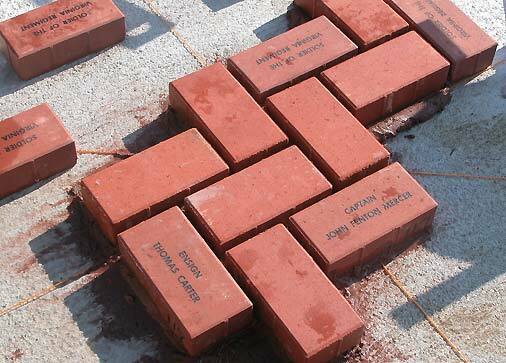 Beyond these bricks are the ones with the names of our wonderful benefactors who contributed so generously to our Finishing Fund Campaign. Their names radiate out from the center as shown here on one corner of the patio. The string marks the diagonal line. 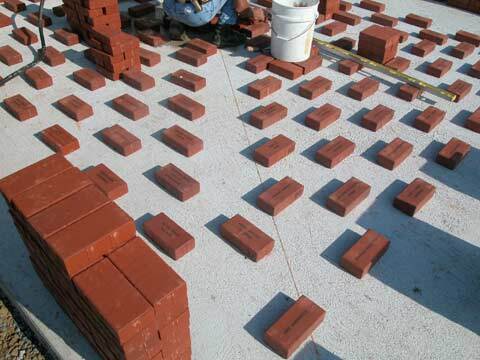 The piles of bricks around the edges of the concrete base are the plain bricks that will fill in the space between the name bricks. 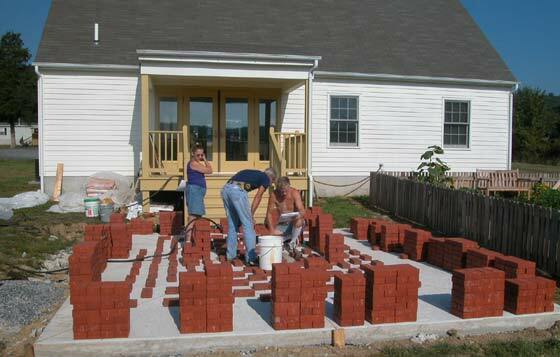 It is a laborious task that stretches the skill of our bricklayer, but we expect to have a patio of which all our members can be extremely proud. Next to the patio is our new Kitchen Garden with the monument to the soldiers and settlers killed in the French and Indian War in Hampshire County. This is the only monument to soldiers and settlers of Hampshire County who lost their lives in war before the American Revolution. It is part of The Fort Edwards Foundation's endeavor to remember and to teach our citizens of the price our forebears paid to give us the land and nation we have today.